Gennaro is one of the most respected chefs in London. He is widely known as the Italian legend who taught Jamie Oliver all he knows about Italian cooking, and he is also a renowned personality in his own right. Born in Minori, on the Amalfi Coast, Gennaro’s quintessentially Italian spirit and positive nature have made him a TV favourite. He regularly appears on Saturday Kitchen as well as his own TV show, Two Greedy Italians. 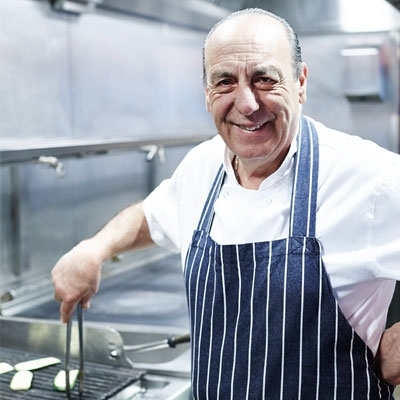 Gennaro has worked in some of London’s most popular restaurants, including Antonio Carluccio’s Neal Street Restaurant. In 1999 he opened his own restaurant Passione in Charlotte Street, London, which was awarded Best Italian restaurant in 2005. His first cookbook, Passione, was published in 2003 and won ‘Best Italian Cook Book 2003’ at the World Gourmand Cookbook Awards and was shortlisted for the André Simon Award. He has since written many other books on Italian cooking. Gennaro is currently involved in Jamie Oliver’s restaurant chain, Jamie’s Italian, which includes over 50 branches nationally as well as opening internationally. He has his own Food Tube channel where you can see him cook delicious dishes.